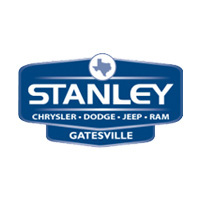 At Stanley Chrysler Dodge Jeep Ram Gatesville, we’re dedicated to earning your business again and again. The first time you walk through our doors could be to browse our selection of used cars. Or, perhaps you’ll stop by to trade an older model for a brand new Chrysler, Dodge, Jeep or RAM vehicle. Our sales staff and our auto financing team have the bar set at the top rung every time, so you can count on finding a loan or lease option that puts the RAM 1500, 3500, Dodge Journey, Chrysler 300 or Jeep Grand Cherokee of your dreams in your driveway, on your terms. When you’re ready to return to our TX dealership for regular car service and maintenance, we’ll be ready to perform whatever work your vehicle requires. And when you’re in the market for auto parts, we’re ready to assist in whatever D-I-Y projects you have going on under the hood of your car. For more information about our full range of services stop into our showroom at 106 S. Hwy 36 Bypass N, TX, 76528 and we’d be happy to assist you with all of your automotive need whether you hail from Killeen, Temple, Waco or beyond.